We have got worrying news from Ivory Coast. Théophile Kouamouo, one of Francophone Africa's leading bloggers, and the project leader of the Rising Voices grantee Abidjan Blog Camps has been arrested for publishing a newspaper report. 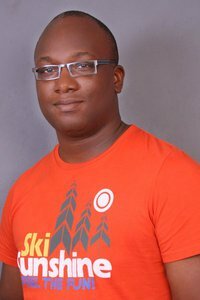 Théophile Kouamouo, a French citizen of Cameroonian origin and a resident of Ivory Coast, is the Managing Editor of Le Nouveau Courrier, a new Ivorian daily launched in May 2010. On 13th of July, 2010 the newspaper published the first of a series of five articles on the “burning issue” of the coffee and cocoa sector which contained information of a recent report on the investigation of 30 people by public prosecutor Raymond Tchimou submitted to the president. It relates in great details the facts upon which the ‘barons’ of the industry, including leading figures Henri Amouzou and Lucien Tapé Doh are charged of having committed incredible felonies for the purpose of diverting tens of billions of CFA francs from the sector's fund. Fraud, misappropriation, embezzlement, forgery and use of forgery, misuse of company assets … Le Nouveau Courrier describes in great detail the methods used, citing financial manipulations, purchases of properties in France, bank accounts in Monaco etc. By order of Raymond Tchimou Fehou, Prosecutor of the county court, three journalists from Le Nouveau Courrier d'Abidjan, Saint Claver Oula, editor, Steéphane Guédé, newspaper editor and Théophile Kouamouo, managing editor, were arrested by the Criminal Police. The prosecutor accused them to have published the findings of his own investigation into the embezzlement in the cocoa-coffee sector. The classified document had been handed over a few weeks earlier to President Laurent Gbagbo. Tuesday, July 13, the prosecutor summoned editor Théophile Kouamouo to his office to compel him to disclose his sources. The journalist declined. The prosecutor then ordered him to be arrested by criminal police, who kept him in custody after the hearing. The newspaper's premises were then searched. Reporters Without Borders reminds that protection of sources is a fundamental principle of the practice of journalism and demands release of the journalists. Our attempts to contact Mr. Patrice Pohe, press secretary of the prosecutor, remained unsuccessful. The meeting with Théophile Kouamouo took place in a relaxed atmosphere. His pace and good mood are undeterred. “We're doing fine,” he reassures. 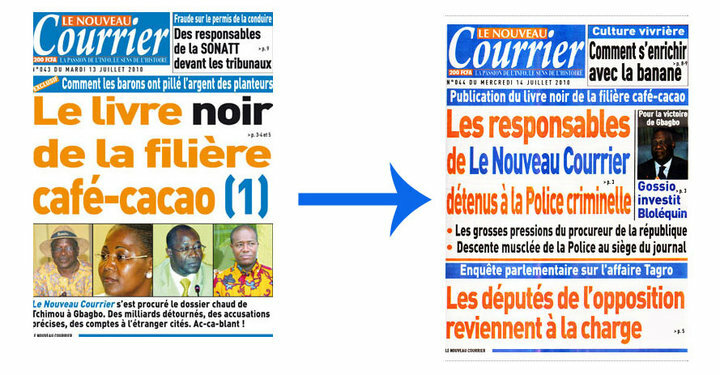 The editorial director of the “Le Nouveau Courrier” is willing to go back over this imprisonment which hides some unspoken intentions on the part of Prosecutor Tchimou. We demand the earliest release of Theophile Kuoamouo and his colleagues. Here is a petition you can sign to show your support. The three journalists, who spent the last two nights in police custody in spite of the pressure to reveal their sources, are waiting to be taken before a judge and charged with “theft of administrative documents.” Since the news of their detention broke out yesterday they have been receiving visits of numerous colleagues and organizations who are showing their support, including the Groupement des éditeurs de presse de Côte d'Ivoire (the newspaper editors’ professional association). Some colleagues have pointed out that the first article in the official Code of Ethics for the Ivorian Journalist published by the Ministry of Communications (see original in French here) states that “the journalist has the right to the protection of his/her information sources”. Several bloggers and journalists have shown their support to Kouamouo and the rest of the Le Nouveau Courrier team through an online petition asking for their immediate release, as well as through Twitter and a Facebook group where they have shared updates about the case. Global Voices author and Translator Suzanne Lehn helped us with the Translation. I have been reading the recent updates from Rising Voices regarding the three journalists from Cote d’Ivoire who have recently been arrested. I am also a blogger for a website called Change.org and created an e-mail action to support the Ivorian journalists online here: http://humantrafficking.change.org/petitions/view/demand_release_of_journalists_who_exposed_human_rights_abuses_in_the_cocoa_industry. Please feel free to circulate the action link to people who may be interested. Thanks you so much for your work!